It’s called a tuque, not a beanie! A few years ago there was a Canadian politician who was running to be the leader of his party. One of the arguments against him was that he had spent a considerable amount of time living and working outside of Canada. I have never understood that argument because I have never believed that geography is what makes us Canadian. 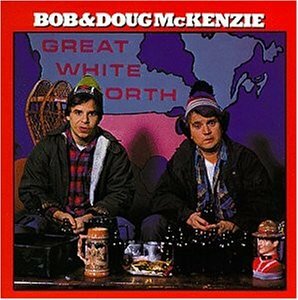 In fact, I have never felt more Canadian than I do now, living on the other side of the world. 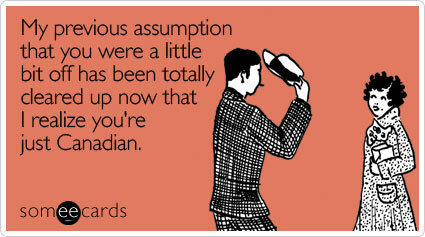 I spend a lot of my time these days with non-Canadians. (Captain Obvious calling!) Of course, living in Japan means that I am surrounded by Japanese people, but even at events designed for and by the foreign community, I am often the only Canadian in the room. And just like that, my cover as a generic North American was busted and I morphed into an igloo-dwelling, French-speaking, maple-eating lumberjack. The thing is, I am a stereotype. I speak both English and French; I love canoeing; I’ve had several up-close and personal encounters with moose; and, yes, I have been known to dress like a lumberjack. So I have a lot of trouble explaining that while I fit a lot of Canadian stereotypes, it’s a very big country with a very diverse population. Ugh… diverse population. I hate myself for writing that cliché but I really don’t know how to avoid it when discussing Canada and being Canadian. Unfortunately, the trouble with explaining cultural diversity is that it is complicated. I am happy to talk about it in a conversation with co-workers or other people who really want to have a conversation, but so often that is not the case. Most discussion of culture in my classroom is less of a conversation and more of a sound-bite. It is tough to explain Canada in one simple, ESL-friendly statement. Living and working outside of Canada has made me think about being Canadian in a way that I never did before. When I see textbooks casually saying things like “with so much winter, it is not surprising that Canadians are good at winter sports,” I want to point out that the weather in Victoria is generally a lot nicer than the weather in Hokkaido. Or, when my American friends poke fun at my “Canadian kindness” I sometimes feel the need to kick a puppy*, just to prove them wrong. At the same time, Canada is a big and tough country to understand. If it weren’t for all those ridiculous stereotypes, the rest of the world really would think we were just America Jr. I guess my question is this: Which stereotypes do we want to debunk, and which ones do we let slide in the name of national identity? Now, if you’ll excuse me, I have to go drink some maple syrup. Sorry. *JUST KIDDING! I would never kick a puppy. I might say some mean things about its mother. love the post. I enjoyed thinking about all the places and times when I have seen moose, fox, geese etc. I also think that Canada is about so much more than its animal population and its human population, which is good because sometimes we hurt one, and the decisions of the other, in terms of elections, etc. can be profoundly disappointing. That being said, we can still say thank you and excuse me, and mean it. Eh?